UPDATE: A winner has been chosen! Check your inbox - you may have won! Bandai's 66 Action Rockman mini figures are due to hit Japan tomorrow! To celebrate, I've set aside a box of ten figures for a little giveaway. 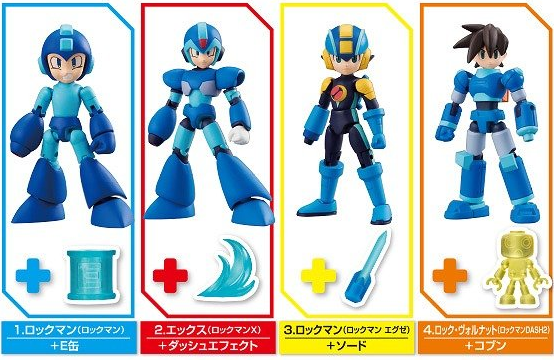 The box includes two sets of five figures: classic Rockman, X, Volnutt, Rockman.EXE and a secret fifth figure. You can keep the second set for yourself or share with a friend! To enter, send an email to RockmanCornerContests@gmail(. )com and include a message about the first Mega Man game you played. What was your first game? What did you like about it? Entries will be accepted from now until Monday, May 2nd at 12:00pm PT. After that, I'll get in touch with ONE winner and we'll discuss shipping info. This particular giveaway is limited to residents of North America only - I'm really sorry. I'm hoping to cover international shipping for the next one, whenever that will be. UPDATE: Nevermind! International shipping has been covered; ANYONE is welcome to partake! Sighing. Not again. Where is the new games ? We don't need the junks in the room. I wasn't aware the makers of toys and figures made video games now. NA only? Makes me sad! I was so ready to enter! I missed the pre-order on HLJ but a matter of an hour. I've been checking every day since and it went straight from Pre-Order Stop to Discontinued. The sadness cannot be described! Do we have to include any other information in the submission, like a shipping address, or is that going to be handled afterwards? Thanks. I sent mine in before it occurred to me. I could pay the shipping... Even then, no chance for people outside USA to participate? Protodude since so many people want to enter that aren't in NA can i donate so there can be international shipping? What's the deal with this secret 5th figure business?!?! Wow, I really should look into this Twitter thing. can't we participate if we agree to cover the shipping cost for oversea? Entered. This is truly an exciting opportunity.